First tree planted for the project - "Grand Union"
The next time you are heading to the North lot of the church, look for the first tree planted as a part of our Memorial tree project. Trees planted can be in response to praise, thanksgiving, remembrance, or even a way to participate in the stewardship of our grounds. 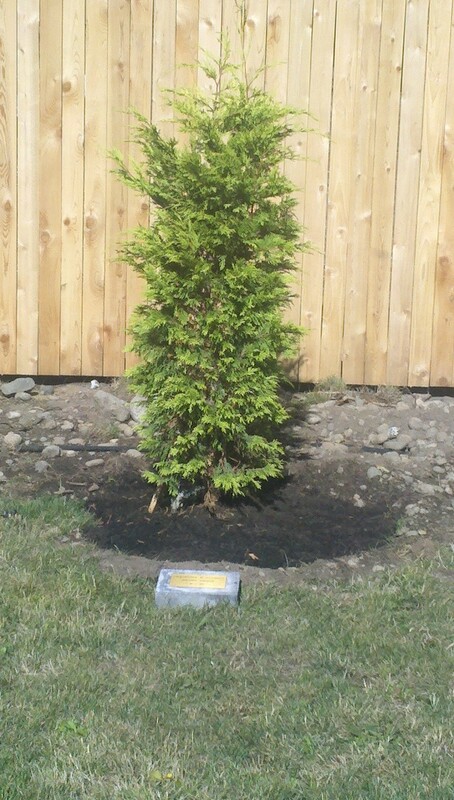 Purchase a tree for $125.00 which includes the tree, planting, a marker stone and brass plaque. Lettering can also be purchased for 70 cents per letter. The hope is to plant 11 Gold Rider, Leylandcypress trees across the north boundary of the property line. This is an ongoing offering and may some day stretch south along the East property line to serve as sound curtain from freeway noise. Make checks payable to St. Barnabas for $125.00 marked Memorial Tree in the memo field.